In ninth grade, Kelly Daniels was called to the principal's office, where his father was waiting. Dad took Kelly and his younger brother Ole for a drive, and after a while, he said, "I figured you should hear it from me first." He said he woke up in jail. And: "To be honest, it was kind of a relief when the guard finally told me I killed Barclay." And then: "You can cry if you want." But Daniels didn't cry. What he felt instead was "something that still kind of amazes me," he said in an interview earlier this month. "It was a strange reaction. It just seemed like all of a sudden my life brushed against the news. 'This is a big deal.'" He felt something similar when he emerged from a week-long fever that nearly killed him in Honduras: "There was this same sense ... of my life being like a book." The memoir starts on that ninth-grade day. In the book, Daniels describes his reaction to his father's confession as "wonder. I'd become an actor playing myself in the movie about my life." It then leaps forward to the author's post-collegiate 20s, documenting penny-pinching travels to exotic locales - what most of us would consider adventures. On those terms alone, Cloudbreak, California undoubtedly works. There's the surreal/absurd "free" resort in El Salvador, where Daniels and bats were the only guests, and table tennis with the guard was the only amenity: "It felt strange to be alone in a place meant for hundreds," he writes. "I imagined ghosts in the other cots, benign ones, hanging around because they had nowhere better to go, glad for my company." There's the fever, a section in which the author expertly captures his delirious confusion and loss of time. The ecstatic post-fever feast, cooked over a campfire on the beach with friends. A hostile time-share pitch in which a former football player berates Daniels about his path in life - at once completely inappropriate and absolutely correct. And a steady romance and steady job in Mexico, where a comfortable stasis threatens to end his restless ways. Beneath all these vivid episodes is a nagging - the pull of a troubled family (incarcerated father, drug-abusing brother, sick mother), of conventional adulthood, and above all of conscience. The Kelly Daniels of the book has few ambitions (and no clear ones), but his undeniable intelligence, resourcefulness, and incisiveness (particularly when it comes to judging himself) made me desperately root for him to be more than an aimless soul. Late in the book, for example, he notes the core difference between himself and his ne'er-do-well brother: "When I'd gotten into my Spicoli transformation, I could see that Ole thought I was cool. ... [N]either of us understood that this was all just a game to me, as much a role for me as it had been for Sean Penn. But for Ole, crime became the real thing, his calling. ... I'd always been a pretender, what we used to call a poser. Ole was sincere. He was also sweeter than I was, more sensitive, more empathetic." But that level of insight is never paired with any sort of drive, so Daniels in his 20s is an intensely vexing protagonist. The book builds to a surfing expedition with his father once the old man is released from prison, and you know precisely how it's supposed to go. But the son was never the surfer his father was, and he angrily gives up: "We had nothing in common, nothing to talk about. Fine. We'd tried. That's life." 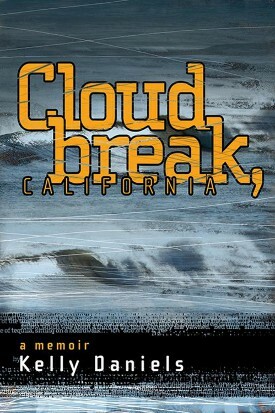 Like Spalding Gray's monologue Monster in a Box, Cloudbreak, California is essentially a chronicle of avoidance - a series of diversions from issues that are occasionally referenced but never directly addressed, written artfully with the clear eyes that introspection and distance provide. 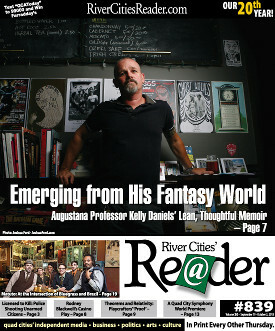 Daniels said that he read Tolkien and the Narnia books (and all their knock-offs) as a child, and "I was obsessed with the idea of being like a Prince Caspian with a double life, that could escape the mundane world of going to school and parents and shopping and lunch and dinner and all that into some kind of magical land where things are more adventurous." And when his father told him he had killed a man, it played into that obsession, he said: "That moment, it was a false thing. There was nothing romantic about this murder, but to my ninth-grade ears ... it did feel romantic ... , like a murder mystery or detective novel or something. That's really where it came from, this idea of entering a fantasy world. And I think in some ways the book is my journey to get out of that fantasy world by going through it, by seeing it to its end in a way and finally coming out as a real person." The book's genesis, Daniels said, was frustration. "In some ways, you could say I've been writing it for many, many years," he said. "A lot of these stories were finding their way into my fiction." "I'm a reluctant memoirist for sure. ... That was kind of a giving in rather than a victorious 'I'm going to write it now!' It was more like, 'Oh well. I guess I'm going to write a memoir.' ... It's a pretty bold thing to say your life is interesting enough for a book. It's definitely something that I felt a little embarrassed about and frequently wondered whether I was being narcissistic about it." Daniels began working on it in earnest in 2009, during a six-week fellowship at the famed MacDowell Colony. It took another two and a half years of revising before he generated any interest among publishers. Whenever he sent the manuscript to publishers, he said, "I totally thought it was ready. I was just optimistic, because I wanted to be done - because we're capable of self-delusion when you want something bad enough. But then when I'd get the feedback, I'd immediately recognize it as true." 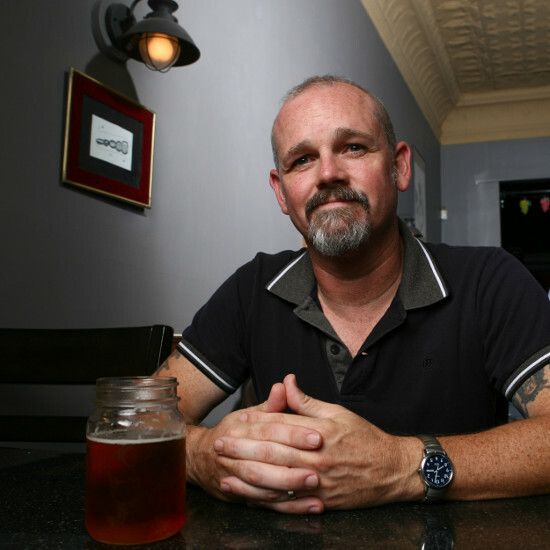 "The key to the book ultimately was deciding that it started that day in that class where I got called out and heard about my father's crime," he explained. "But I certainly didn't know that that was going to be the structure when I started writing it at the colony." That recognition, he said, was an epiphany, "but then I doubted it right after." He eventually trimmed the book too much, to the point that his publisher asked him to add material back in. "I was deadly afraid of losing track of the reader," he said. "I was really trying to make it a quick read. And I was afraid of it being rejected [by readers] at any given point." That alludes to Daniels' ambitions for the book. "I wrote it for a wide audience," he said. "I didn't write it for other writers, or for academics. ... I wanted to make it the kind of book that fans of The Glass Castle [the 2005 memoir by Jeannette Walls] or something would want to read." Although the author described the finished work - coming in at just over 200 pages - as a "quick read," another adjective he used seems more appropriate: "lean." The narrative detail and elliptical structure owe more to novels than autobiographies, and it's been pared down to what is essential to the story. And while it proceeds chronologically, Daniels cleverly treats real-world time as inconsequential - keeping readers disoriented by providing only a few markers (such as O.J. Simpson's Bronco ride) to place events and sometimes letting childhood memories bleed into the book's present. The author isn't coy about where things take place, but geographic and temporal specifics are largely elusive. The effect is to force readers to submit to the vivid mush of memory - the textures, sensations, and emotions over facts. The dialogue - infrequent but often mundane or expository- and the no-free-lunch refrain are the book's weakest elements, but they're easy to overlook when the remainder is so richly detailed and nuanced. It's certainly an easy read, yet it also feels like a durable work, one that will reward multiple visits. Daniels said he hopes Cloudbreak, California will be lasting for reasons beyond its merits: "I'd also like to think that this book might have a life beyond its first printing, because if I manage to build a career ... people get curious about the person behind the book." For more information on Kelly Daniels, visit AuthorKellyDaniels.com.